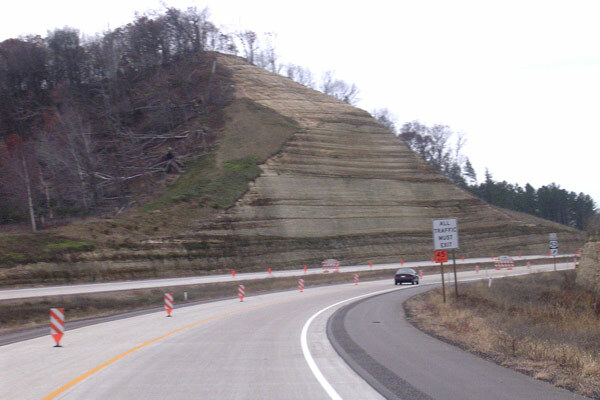 This is the second of two featuring photos related to the former BYPASS US-53 route in the Eau Claire area, taken on November 4, 2005. BYPASS US-53 was a temporary route designation which existed from 2005 to 2006 while the remainder of the US-53 freeway around Eau Claire was being completed and these photos attempt to preserve the history of this temporary, and now decommissioned, route. 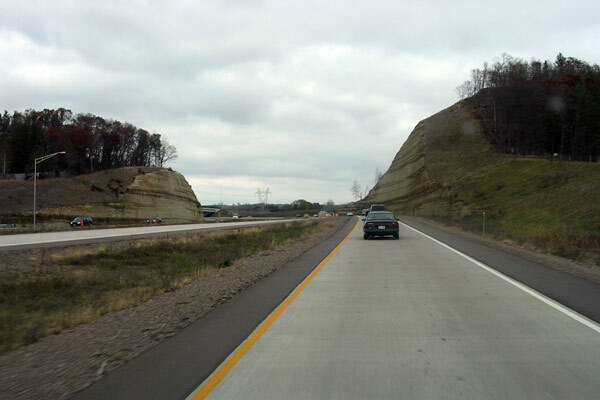 This page consists of photos along the freeway portion of BYP US-53 (now part of US-53). Page 1 features photos related to the North Crossing Extension. View of the North Crossing Extension overpass spanning the incomplete US-53 bypass freeway at Eau Claire on November 4, 2005. This photo was taken from the southbound off-ramp leading to the North Crossing and shows the end of the completed freeway. The remainder of the highway from this point southerly to the Oakwood Mall area would be completed and opened to traffic within nine months. Photo ©2005 by Christopher J. Bessert. All Rights Reserved. Photos may not be used in any manner without prior written permission. Southbound BYPASS US-53 (now just US-53) approaching the Fuller Ave overpass, taken November 4, 2005. At the time, the freeway ended at the North Crossing Extension just around the corner to the right and all traffic was forced off there, hence the FREEWAY ENDS / 1500 FEET" sign and the closed left lane in this photo. Photo ©2005 by Christopher J. Bessert. All Rights Reserved. Photos may not be used in any manner without prior written permission. 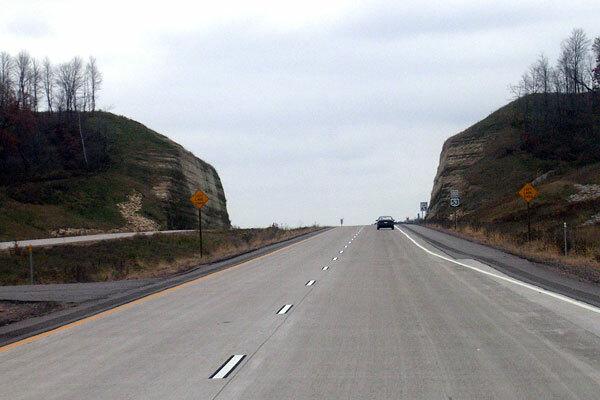 A view of the southern of two cuts made for the US-53 bypass freeway, taken on November 4, 2005 from the northbound on-ramp from the North Crossing Extension. 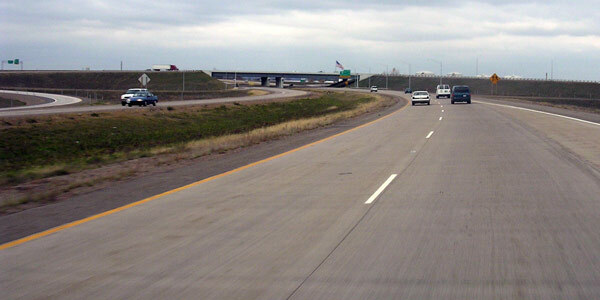 Merging with traffic on the freeway was not necessary, as the freeway began at this location from mid-2005 through mid-2006. In the distance, a tiny piece of the Fuller Ave overpass is barely visible. Photo ©2005 by Christopher J. Bessert. All Rights Reserved. Photos may not be used in any manner without prior written permission. 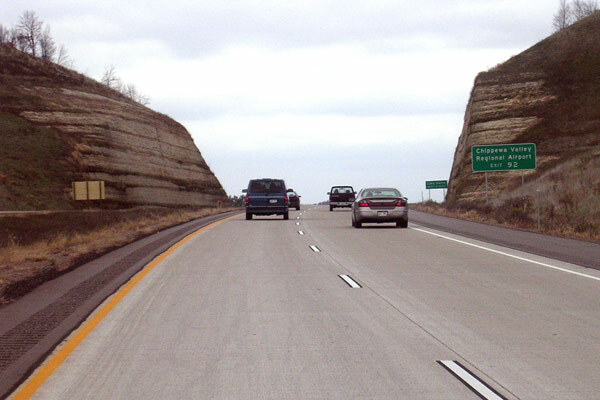 The southern cut along the US-53 bypass freeway (then signed as BYPASS US-53) taken on November 4, 2005, looking south from the southbound lanes. Also note the blocked left lane, the "ALL TRAFFIC MUST EXIT" sign and, in the distance, a "SOUTH BYPASS US-53" route marker assembly directing traffic off at the North Crossing Extension ramp. Photo ©2005 by Christopher J. Bessert. All Rights Reserved. Photos may not be used in any manner without prior written permission. 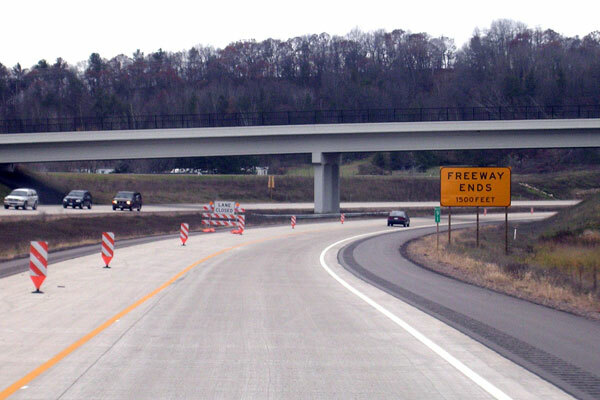 A BYPASS US-53 route marker reassurance assembly on the northbound freeway north of the North Crossing Extension in Eau Claire, taken November 4, 2005 (the Fuller Ave overpass is in the background). Normally, a simply reassurance route marker assembly is not notable, however since BYP US-53 was a temporary route, this assembly only existed for less than ten months. Photo ©2005 by Christopher J. Bessert. All Rights Reserved. Photos may not be used in any manner without prior written permission. Looking northerly along the northbound lanes of BYPASS US-53 (now just US-53) at the northern of two large cuts made for the freeway. The photo, taken November 4, 2005, also shows some of the auxilliary exit signage ("Chippewa Valley Regional Airport, Exit 92") for the Melby St interchange on the other side of the cut. Photo ©2005 by Christopher J. Bessert. All Rights Reserved. Photos may not be used in any manner without prior written permission. 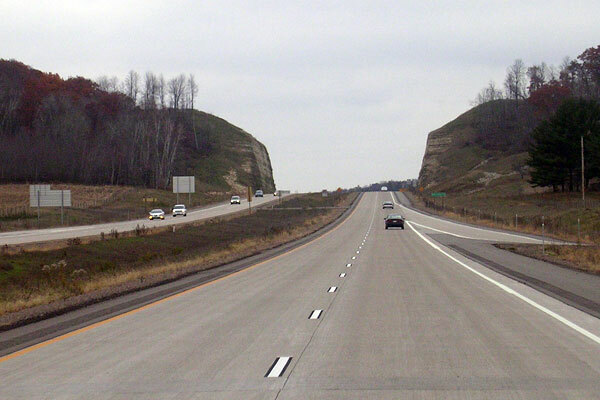 A view of the northern cut, this time looking south from the southbound lanes of BYPASS US-53 (now just US-53) in Lake Hallie, taken November 4, 2005. The Melby St southbound on-ramp is visible on the right. Photo ©2004 by Christopher J. Bessert. All Rights Reserved. Photos may not be used in any manner without prior written permission. Another southbound view of the north cut several hundred yards ahead of the previous photo. Note the final few feet of the Melby St on-ramp taper at the lower right. Photo ©2005 by Christopher J. Bessert. All Rights Reserved. Photos may not be used in any manner without prior written permission. Advance exit sign along BYPASS US-53 (now US-53) northbound in Lake Hallie for Exit 94. While it is clear this is not the permanent sign for this location, the inclusion of just a CTH-OO route marker and "1 MILE" made it a very odd-looking sign. 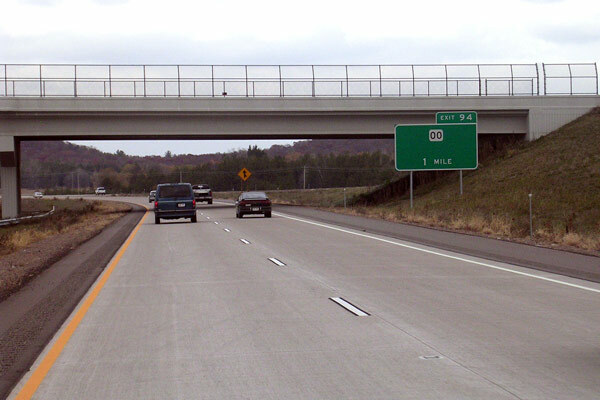 This interchange now also serves as the access for STH-124 and Chippewa Falls from the south, but at the time the photo was taken (November 4, 2005), STH-124 had not yet been routed along CTH-OO. Compare this image with the next photo. Photo ©2005 by Christopher J. Bessert. All Rights Reserved. Photos may not be used in any manner without prior written permission. 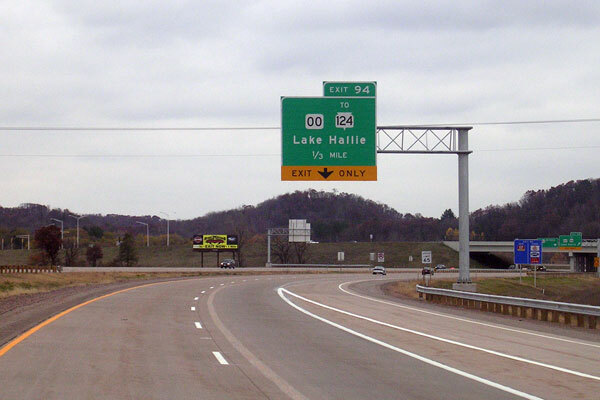 The final exit signage for Exit 94 northbound on BYPASS US-53 (now just US-53) in Lake Hallie. Taken at the same time as the one in the previous photo, this sign features both the CTH-OO route marker and the "Lake Hallie" legend, while the previous sign only included the route marker. 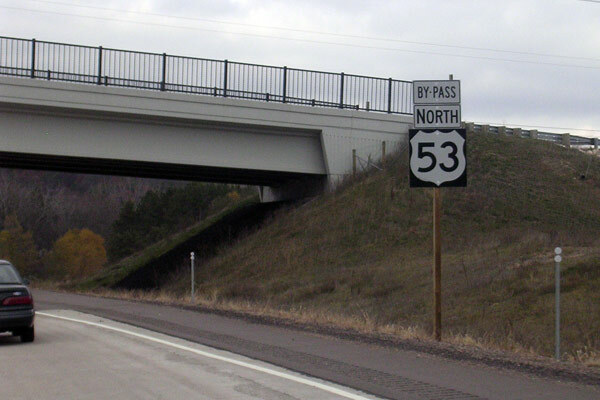 Both of these signs have likely been removed and replaced with ones including STH-124 markers and "Chippewa Falls" as well since the completion of the entire US-53 Eau Claire bypass. Photo ©2005 by Christopher J. Bessert. All Rights Reserved. Photos may not be used in any manner without prior written permission. Exit signage at Exit 94 on southbound US-53 in Lake Hallie. This sign is interesting in several ways, first signifying that the exit is for CTH-OO only and that STH-124 is reached via CTH-OO. 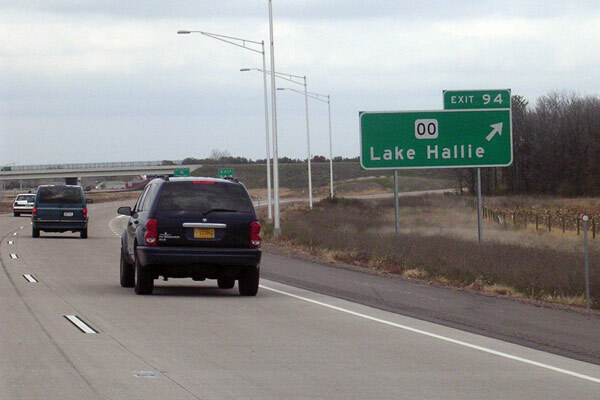 While that was technically true at the time the photo was taken on November 4, 2005, within a few weeks STH-124 had been truncated to this interchange at Lake Hallie and the "TO" would have been incorrect, although WisDOT may have chosen to cover it up after that time. In addition, this exit is also the northern terminus of BUSINESS US-53 and no room had been left on this sign for the inclusion of a BUS US-53 route marker. Also, at the time the photo was taken, the US-53 mainline designation exited the freeway at this location, but that movement was rather poorly signed. Photo ©2005 by Christopher J. Bessert. All Rights Reserved. Photos may not be used in any manner without prior written permission. A BYPASS US-53 route marker reassurance assembly on the southbound freeway south of the CTH-OO interchange in Lake Hallie, taken November 4, 2005 (an auxilliary sign for the Melby St interchange is in the background). 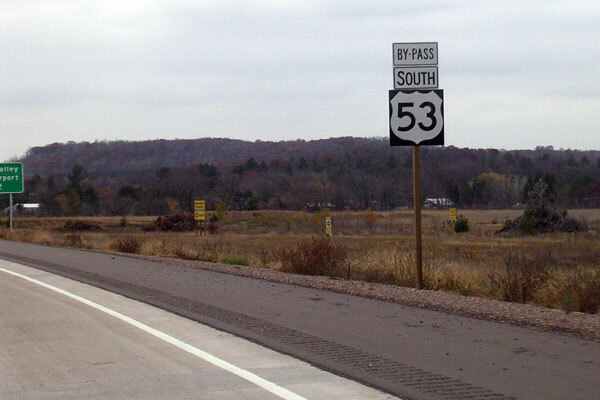 Normally, a simply reassurance route marker assembly is not notable, however since BYP US-53 was a temporary route, this assembly only existed for less than ten months. Photo ©2005 by Christopher J. Bessert. All Rights Reserved. Photos may not be used in any manner without prior written permission. A view of the STH-29 freeway interchange from northbound US-53 in Lake Hallie on November 4, 2005. 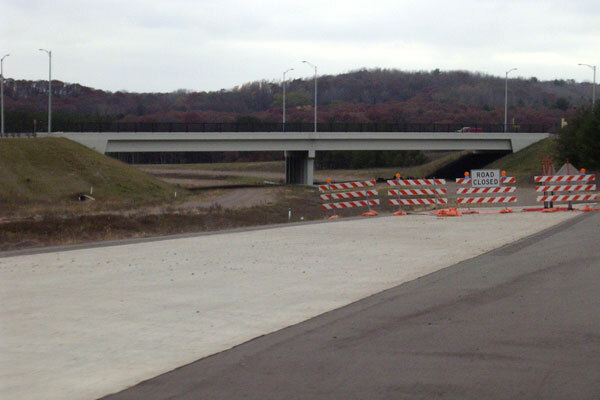 Visible are the twin overpasses for the STH-29 freeway bypass of Chippewa Falls, opened less than three months earlier, as well as the ramp from eastbound STH-29 to southbound US-53 on the left side of the image. The US-53 freeway at this point had been open for approximately two years. Photo ©2005 by Christopher J. Bessert. All Rights Reserved. Photos may not be used in any manner without prior written permission. Another view of northbound US-53 at the STH-29 interchange in Lake Hallie, taken on November 4, 2005 a few hundred yards north of the previous photo. 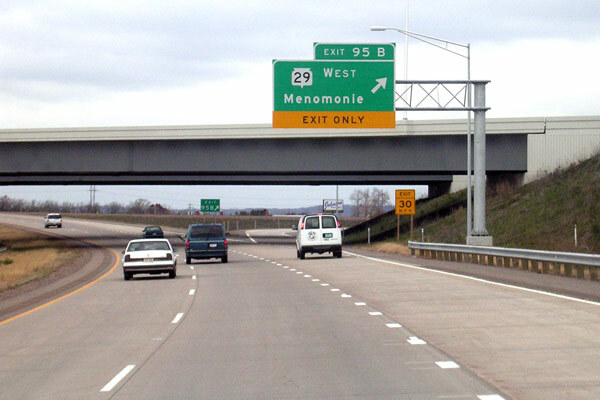 This photo shows the westbound control city for STH-29 is Menomonie. Photo ©2005 by Christopher J. Bessert. All Rights Reserved. Photos may not be used in any manner without prior written permission. 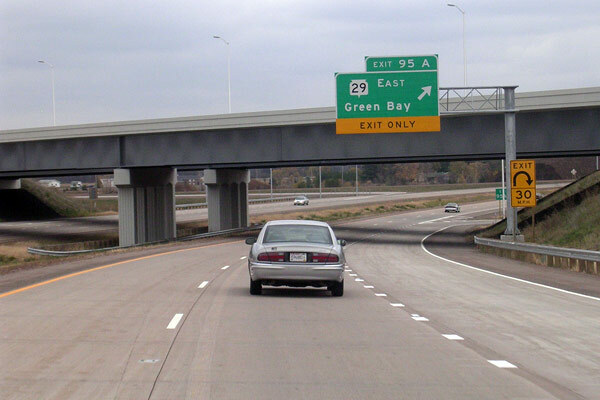 Yet another view of the STH-29 interchange in Lake Hallie, this time taken from southbound US-53 and showing the twin STH-29 overpasses and the exit sign for STH-29 EAST with a control city of Green Bay. While the US-53 freeway here had been open for two years, the STH-29 freeway and associated ramps had only opened three months prior to this photo. Photo ©2005 by Christopher J. Bessert. All Rights Reserved. Photos may not be used in any manner without prior written permission. Eau Claire Area Map - showing the current highway configuration including all 2006 changes.